The damage done was total. She spent her days, her tendril, sap-green days, walking up and down, up and down, her head jerking to the beat of a drummer so distant only she could hear. Elbows bent, hands on her shoulders, she flailed her arms in an eternal, grotesquely futile effort to fly. Beating the air, a winged but grounded bird, intent on the blue void it could not reach - could not even see - but which filled the valleys of the mind. I'm sure many of you recognize this passage from the end of Toni Morrison's The Bluest Eye - and you're probably wondering what it's doing at the beginning of a piece Ana Castillo, don't worry, we'll get there - in this passage, we see Pecola Breedlove wandering, lost and alone, through a garbage dump. She has, in Morrison's words, "stepped over into madness." The author's allusion to a beating, flailing, grounded bird sweeps us back to the eve of the twentieth century, 1899, and the final pages of Kate Chopin's The Awakening. Edna Pontellier, certain she cannot live a truly independent life, returns to Grand Isle to take her final swim. All along the white beach, up and down, there was no living thing in sight. A bird with a broken wing was beating the air above, reeling, fluttering, circling disabled down, down to the water. Edna's desire for independence invites her husband and social circle to perceive her as mad, and the ostracism that ensues drives her into that very madness. The bird, broken, disabled, is, of course, a metaphor for Edna herself. These two texts, one published on the eve of the twentieth century and the other published in the 1970s, bookend nearly three-quarters of the twentieth century and remind us that the recurrent trope of madness Gilbert and Gubar observed in especially Victorian literature extended into, indeed dominated, the female literary tradition of our twentieth century American women writers. From Lily Bart to Esther Greenwood, from the narrative voice of Sylvia Plath to the narrative voice of Anne Sexton, madness symbolized the impinging constraints of Althusser's ideological state apparatus, of Foucault's panopticon. Recent novels, however, reveal that the trope of madness, at least in the work of some American women writers, is evolving into the trope of disability; the disability has moved from the body of the bird, as Chopin used it, on to the body of the female protagonist herself. These protagonists, manifest the crippling pain of the past, of their othered status, of their societal repression, oppression, suppression, not through madness, but through a literal crippling. 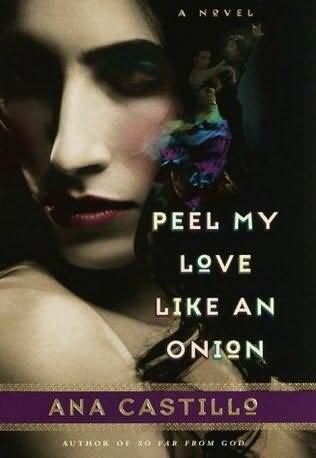 Prominent among these novels is Ana Castillo's latest: Peel My Love like an Onion. You put on your new cross-trainers assembled in a foreign land by women and children at slave wages so you try not to think of what you paid for them, and begin to walk the streets of your city at sunset. You say your city the way some Americans say this is their country. You never feel right saying that - my country. For some reason looking Mexican means you can't be American. And my cousins tell me, the ones who've gone to Mexico but who were born on this side like me, that over there they're definitely not Mexican. Because you were born on this side pocha is what you're called there, by your unkind relatives and strangers on the street and even waiters in restaurants when they overhear your whispered English and wince at your bad Spanish. Still you try at least. You try like no one else on earth to be in two places at once. Being pocha means you try here and there, this way and that, and still you don't fit. Not here and not there. This liminal space, the space of Anzaldua's borderland, traps Carmen and metonymically stands in for the borderland space she must face as a survivor of polio. Not fully crippled, she is, after all, able to dance the flamenco, yet not fully healthy either, Carmen lingers in the interstices, the cracks caused by race, gender, class, and disability oppression. Indeed, her disability is a physical manifestation of those first three. But why would the trope shift? Why would writers, more and more - and we are thinking specifically of Fe in So Far from God, Lauren in Parable of the Sower, and Pearl in The Kitchen God's Wife, rely on a physical disability, like polio, like voicelessness, like hyperempathy syndrome, like multiple sclerosis, rather than a mental disability, like madness, to indicate, to designate, to symbolize society's crippling influence? Perhaps the phenomenon is occurring because we are living in the age of political correctness in which disability is accepted and even, at least hopefully, accommodated. Perhaps women writers, acutely aware of their othered status, albeit improved, hope to pull other "victims," as bell hooks phrased it, from margin to center. Perhaps the Bloomian anxiety of influence drives writers to look for new tropes, new techniques. Perhaps madness allows for an escapism that women, as a result of their improved status, no longer need. While I believe all these points have merit, more importantly, the trope of madness has become the trope of disability in many texts because the endings of women's novels have changed. While not a novel, Crimes of the Heart made its New York premier in 1980 and, with that premier, announced a new narrative trajectory. The three sisters, Babe, Lenny, and Meg, face the same obstacles as their antecedents, and certainly face madness along with their antecedents, but this plotline ends with the three coming together, solving their problems, and forming a supportive sisterhood. Toni Morrison's Jazz, Amy Tan's The Joy Luck Club, Ana Castillo's So Far from God, Olivia Goldsmith's First Wives Club - influenced by the positive changes made by the civil rights movement and the feminist movement, these new novels end with optimism, pragmatic solutions, hope for the future - a trend we have been calling the new literary idealism. No longer capitulating to repressive ideologies and value systems, these protagonists struggle, change, heal, and grow. The new heroines cannot be mad in the end because they will need all their mental faculties to solve their problems and move into a happy, healthy, whole existence. As madness begins to release its stranglehold on the female literary tradition - indeed we believe it has not yet completely let go - women writers face one grim reality: things are still not perfect. So how does a writer represent that imperfection while leaving her protagonist a sound mind? She finds a new trope. Fe, Lauren, Pearl, and Carmen are certainly proof of this. So we have good news and bad news to report to you today. The bad news first, of course. The bad news is that we still need a trope, a symbol of the crippling societal forces on women's lives. The good news is, at least for the most part, we have relinquished the madwoman and the tragic ending. And when I don't want to see anyone I don't answer the telephone at all, pull the shades down tight, put on my own CD on the new stereo with six speakers around the apartment and just dance. I dance and dance and dance. Magically, on the final page of the book, her polio seems to disappear, or should we say she transcends it, as she overcomes the hurdles in her life. Listening to the sound of her own music, the beat of her own drum as it were, Carmen heals. So we write this piece to announce the possible death of madness as the dominant trope in the female literary tradition. We can't be certain yet; we are still searching, watching, waiting, like many of you. although Carmen may be ready to ask the question, "what do I need feet for when I have wings? ", we don't think Ana Castillo, or her fellow American women writers, are ready to ask the same question quite yet.